Eternity Publishing, established in 2005 is the company name used by me, Craig Cochrane, to sell my Roleplaying Game based books and pdfs. The name was a part tongue-in-cheek, part self-deprecating stab at my own procrastination in getting content released. …as well as the brilliant Peter Szmer, who does all the interior art in the Vampire Bestiary as well as the covers for the individual pdfs. 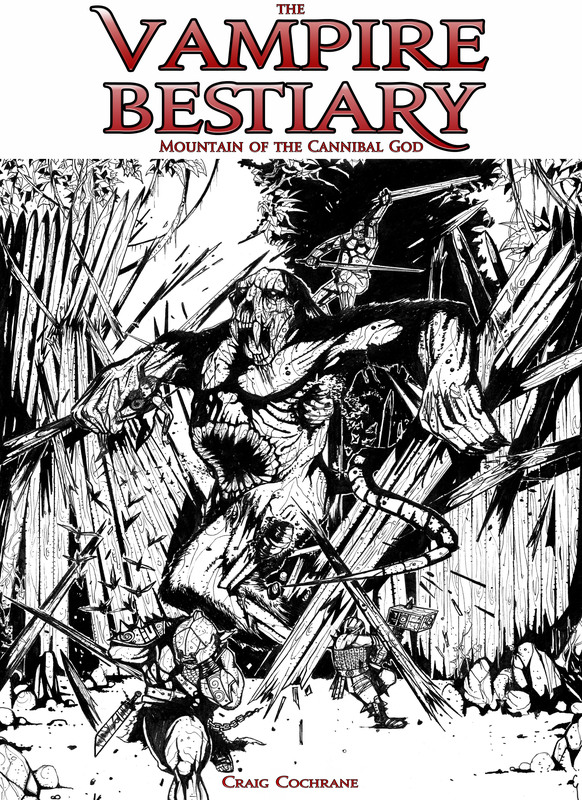 Vampire Bestiary: Mountain of the Cannibal God – ON SALE HERE NOW! See Previews HERE. 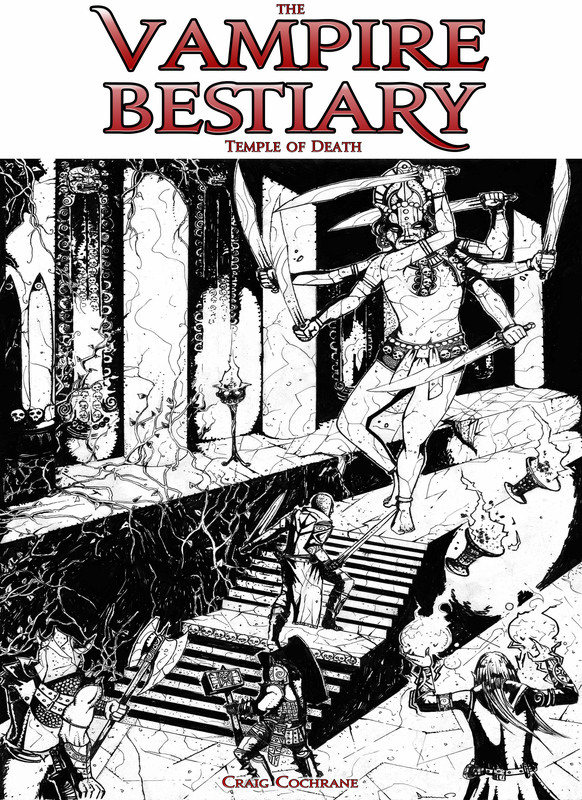 Vampire Bestiary: Temple of Death – See Preview HERE. Vampire Bestiary: Castle Dracula – See Preview HERE. Against the Reptile God: The Serpent Riders – Some Thoughts on this project HERE. I am eager to introduce my artwork because of my great interest and passion for drawing fantasy and horror images, creating graphic novels and designing book covers.I believe that my works show that I am capable of applying original thoughts to any given problem and prove that I am not dependant on mimicking styles. As far as my education is concerned, I successfully completed five years of art education in Collage of Fine Arts. I feel that this education has played a significant role as I have studied there thoroughly Life and Architectural Drawing, Painting, Sculpture, History of Art, Silk Inking and Lettering. I have also been doing some regular commissioned work for different clients, like Dark Hart Press, The Usherwood Adventures, From The Tomb, Avatar Art, Headless Hydra Games and Alluria Publishing which are all in the magazine and book publishing.Further more I also had some of my work published in From The Tomb magazine alongside a complementary article from the editor. Hy mate glad you have found a good artist. Whish it was me but I can’t drore good enough for you. Please could you tell me ho wis creating the 3.5 aditions. Please let me know when you have published the vampire would like to se it even if I hope there will be a 3.5 adtion from it. Please could you tell me if ther will be any coel demons devels dragons and shape shifters my faverets comeing up soon and could you perhaps give me a sneek peack into what they will be. Yes I am glad to be bringing Peter onboard. The 3.5 conversions are being handled by a few people on the forums. But we can work out the details after I get the darn Vampire Bestiary completed. I will email you when the book is finished. There are certainly a number of shape-shifters amongst the various vampire entries…including Dracula himself. There will be demon-possessed Vampires called the Strigoi in the second Vampire Bestiary. I will have a big section on Devils within a forthcoming book, but better not let me get ahead of myself. Lets get the Vampire Bestiary on sale and then worry about things like conversions and later books. Hey UK, I was a IH handbook presale purchaser back in the day, way way back in the day. and I lost contact after a while during the update process. I was just curious as the ascension IH I have is V 3.1 if there was another update after this or if this is the most current form of the book as it were. Ascension v3.1 was the latest release, yes. It has all the completed text and about a quarter to one third of the art I had planned. I apologise for not getting the rest of the art completed. Its something I have been thinking about and then having a print release of Ascension, but I cannot say when that will happen at this point. I’m disappointed that there is still apparently no 4e product available. Why not take several shortish sections from the stuff you’re working on and sell them as $5 pdfs on rpgnow? They can always be revised later for the finished product. Yes its been a bit of a nightmare (on my part). That said I am almost finished (whatever that means) and I was about to send you (in about a week) the first 80 pages completed (with full art) just to get your general impression. The art is almost complete, I think after this week only 4 more illustrations needed. 1) My annoying habit of constantly expanding the book I am working on because I have too many ideas. I basically turned a 48 page book into three 128 page volumes. Its crazy, but I just can’t help myself. I need to cut that out. 2) The second problem I have noticed is that if I get stuck on something, I’ll move on to another section, leaving the other part 80-90% complete. That creates these ‘minefields’ in the book where I’m either stumped or just not happy with something. If I can’t see the finish line within a week or two I’ll divide it up into smaller pdfs. I mean the Cannibal section and Cultist sections are more or less completed. A 16 page Cannibal pdf (maybe $2.50?) and a 32 page Cultist/Thuggee Cult pdf (maybe $5?) could precede the (what would still be an 80 page) Vampire Bestiary. So like I said, I’ll be able to show you the work in about a weeks time, then you can give me your opinion. OK, send me the work whatever condition it’s in in a week, and I’ll give you feedback! 🙂 But anyway as a general point, I think it’s a good idea to sell a variety of pdfs of various sizes; 256-page books are fine for print publishing and allow economies of scale compared to 32-page pamphets, but you can be a lot more flexible in pdf. 32 pages of high quality new 4e D&D content with art seems good value for $5 on pdf, printed 32 pp from most publishers runs in the $10-$15 range from what I’ve seen. I also don’t factor in pages such as Contents, Credits and so forth into the pricing. I think that seems pretty fair, especially when you consider I use a smaller font than most other companies so you get more text per page. Plus I have also had to commission the art this time and thats got to be taken into consideration. Looking over the work, with the Cannibals + Wendigo section I think that will be about 24 pages, while the Cultists + Wights will be around 40 pages. The Vampire Bestiary itself would have 60-70 unique pages but I might fold the Wendigo in there. I realize this question is probably answered elsewhere, but I recently stumbled upon your Immortal’s Handbook : Ascension and Epic Bestiary Vol. 1, there seems to be references to more product in this line but I can’t seem to locate any information on it. If it’s not too much of a burden could you please inform me of why? I jumped from 3.5E to 4th Edition. Fell out of love with 3rd Edition. I had plans for things like the Immortals Index (lots of pantheons detailed), Immortals Handbook: Grimoire (really epic magic) and more Epic Bestiary volumes for 3.5 but I just really started to dislike the system. Then 4th Edition came out and solved a lot of the problems I had with 3.5E. Ironically I think most of the people who liked my work prefer 3.5/Pathfinder to 4th Edition, but if you are not having fun designing for a system and your hearts not in it then you just have to let it go. That said I don’t like to dismiss those fans completely, so my idea was to work in 4th Edition and then have some help converting over to Pathfinder. The first Vampire Bestiary is in the process of being converted. Eagerly awaiting the new Immortals Books…any update on those? Howdy Ioungwhra, nothing in the immediate pipeline unfortunately. I have taken a (hopefully) temporary break from writing to work on some videogame proposals. I should have them wrapped up before the end of March. The outcome of those will determine how quickly I resume my writing. So I will return to writing, but if I have anything specific ready for release I will definitely make some new posts here to talk about it. Your first two book are wonderful. Please tell me the price to buy them. I basically fell out of love with 3rd Edition, it was just too needlessly complex at epic level despite all my attempts to condense elements to make it playable. thank you very much. I will taste it calmly but from what I see it sounds spectacular. I think that the complexity is inevitable for a rpg played at cosmic level with a gaming system that allows you to appreciate the differences between a common man and an elder one or even more powerful entity. There are games that allow you to play divinities, however, only with the 3rd / 3.5th edition you can perceive the actual difference of power along with the tiring but fulfilling character’s growth, as well as the incredible variety of powers that a being of cosmic power can possess. Certainly not a game for everyone but is a unique experience. I also think that more ideas could be used as magical technological / sci-fiction weapons, super powers and super-psychic powers in an overall view of the omniverse. Ancient civilizations also constituted by non-dead or even more biased creatures could have reached a technological and / or magical development so powerful to challenge even the oldest gods. Hope you will reconsider. In that case I am available to help you and of course to buy your books. Designing for epic 3/3.5 is incredibly taxing and while I was initially very driven; the sheer amount of maths (the tedious stuff) vastly exceeded any amount of design (the fun stuff) I was doing and that started grinding down my resolve. But I am very proud of the work and I am glad people like yourself really enjoy and appreciate it. I agree many of the powers could be used in different genre’s – although the higher up in power you go the more all the genre’s converge (fantasy, sci-fi, superhero etc.). I can’t begin to tell you how humbling it is to have people (10+ years after the books were released) say how much they loved the Immortals Handbooks. Thanks so much. I am a huge fan of D&D 4e (D&D 5e just didn’t do it for me and I’m no newbie I started playing THE game in 1977). I know there was plans to release Volume 2 and 3 and I’ve read somewhere these books were almost finished. Would it possible to have access to the work you’ve already done (in web, pdf or any form you fancy)? I played a little 5E recently. While I prefer 4E my observations are 5E is friendlier to new players whereas 4E is more rewarding to those into tactics and character building. Glad you like the Vampire Bestiary – thanks very much for your comments and for buying the pdf. Much appreciated. Volume 2 is virtually finished (other than the adventure bit and some editing) and has been for some years. Volume 3 is about half finished. 1. Sales for the Vampire Bestiary (after D&D split into 3E, Pathfinder, 4E and at the time 5E was just announced) meant initial sales were basically at the break even point. That really sapped my enthusiasm. 2. I was struggling with the adventure portion of the book and I wanted to add a short adventure to the Vampire Bestiary 1. For whatever reason I just couldn’t get it ‘over the line’. The few years following the Vampire Bestiary release I was working on some video game proposals and was SO close to landing my dream job as a video game designer you wouldn’t believe it – I was basically told in an interview I had the job, but then events (at that company) conspired that very week to mess that up. The last 18 months I have been working on a comic book with a great artist from the Philippines. The plan is to have that finished for early next year and do a Kickstarter or Indiegogo for it. I might consider doing some sort of Crowdfunding for a printed version of the Vampire Bestiary Volume 2 (and maybe 3 as well). If I thought I could get maybe 50 backers that would be enough to make back the costs of commissioning the art. 4e got a bad rap when it came out, bad timing, too different, killed too many sacred cow, videogamey, the year of Gygax death, etc. For myself, DMing since I was 9, I just love those 4e monsters (post mm3 of course). I have never been part of a kickstarter but if you did one for the Vampire Bestiary, I would gladly join. I think the biggest problem with 4E is that its unnecessarily rules bloated with its list of powers (hence I Revised the 4E Fighter and Wizard class on this website). I also think the official 4E adventures were very badly thought out – I reviewed a few here myself. But I think the strengths of 4E outweigh the weaknesses and its a great system for expert players. Its the Advanced D&D to 5E’s ‘basic’. 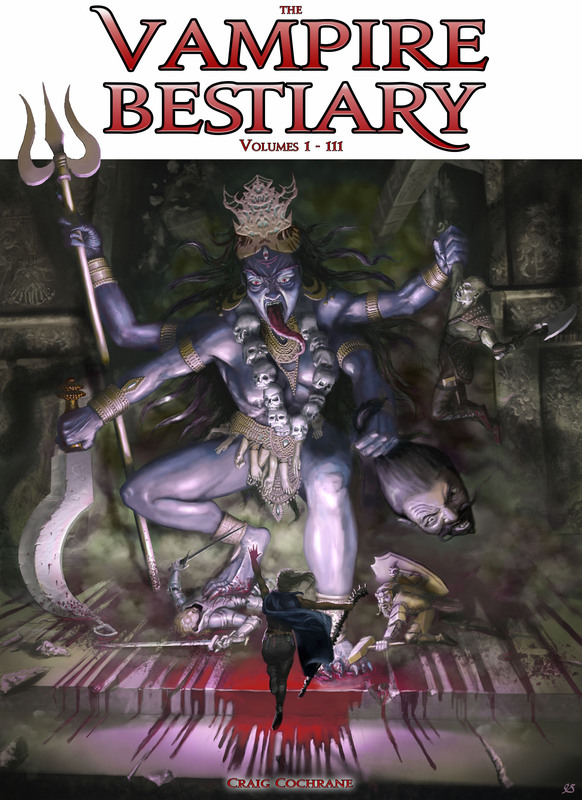 I’ll start a thread on ENWorld tomorrow about a possible Crowdfund for the Vampire Bestiary. If I can get a few people interested I’ll definitely do it. I have a few cool idea including an Appendix of new monsters people can suggest (such as 4E updates of my Epic bestiary monsters)..